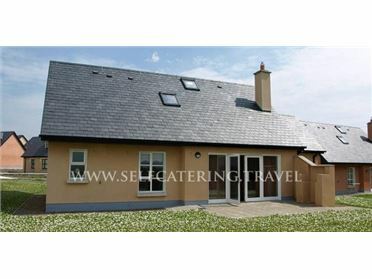 Lounaghan House is a character country house, two miles from Kenmare in County Kerry. With four bedrooms, each with an en-suite, the property sleeps eight people. There's also a ground floor cloakroom, a kitchen with dining area, a utility room and a sitting room with a solid fuel stove. Outside, there is ample off road parking plus a lawned garden with furniture. Lounaghan House sits in a perfect touring area, with stunning scenery all around, and the Bay of Kenmare and the Ring of Kerry on the doorstep. A picturesque town situated on the stunning Bay of Kenmare, overlooking the gleaming Atlantic Ocean. Beautiful beaches, wildlife and lovely scenery abound here. Kenmare is an interesting town, full of character and colour, with long winding streets setting the scene for farmers' markets, artists' galleries, lovely little boutiques and some of the best restaurants in Ireland! This great location is not to be missed! Oil central heating with electric fire. Electric oven and hob, microwave, fridge freezer, washing machine, tumble dryer, dishwasher, TV with Saorview, DVD, selection of books, games and DVDs. Fuel and power inc. in rent. Bed linen and towels inc. in rent. Cot and highchair on request. Ample off road parking. Lawned garden with furniture. One well-behaved pet welcome. Sorry, no smoking. Shop 2 miles, pub 5 mins walk..